Continuing the work of ASP has proved difficult for some time now. The trustees have worked hard to come up with new ideas about a way forward, but those ideas have not come to fruition and so the charity has now to be dissolved. we live in a very difficult funding situation - support form Arts Council often depends on the achievement of prior support from other sources and we have been unable to achieve any core funding to employ a project director and fund raiser to do the work which the trustees themselves do not have time to do. much of the work we have done in the past has been superseded by new curators at many English cathedrals. we have been unable to achieve a suitable working relationship with any other organisation working in a similar field. It is thus that with great regret but also with pride in what has been achieved over the last eighteen years that we now draw our activities to a close. Our legacy will, we hope, be safeguarded by the ongoing maintenance of our website, and the depositing of our archives at Chichester Cathedral. With the funds remaining we hope to establish an annual lecture, and later this year we hope to arrange an act of worship to celebrate what we have done and to give thanks for the achievements of all those who have worked with us and contributed to the growing relationship between faith and art in our time. 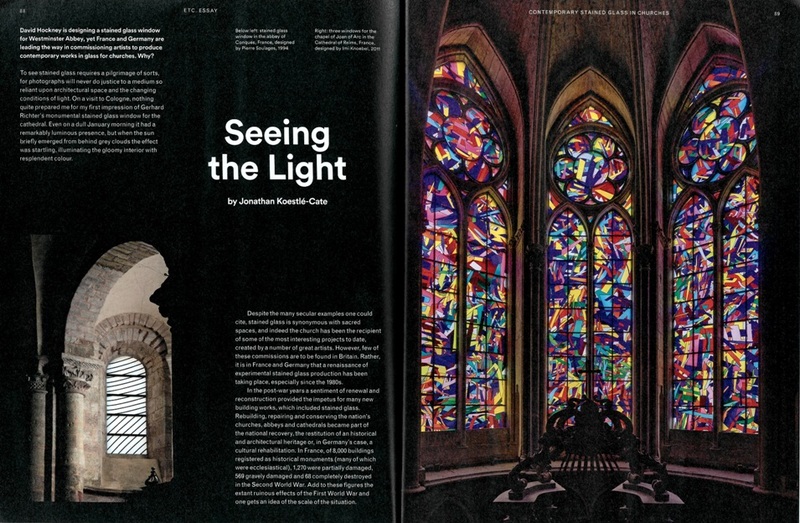 The Spring 2017 edition of Tate Etc, Tate Gallery's magazine, has a short article on contemporary stained glass by Jonathan Koestlè-Cate, one of the trustees of Art and Sacred Places. You can find the full text below. David Hockney is designing a stained glass window for Westminster Abbey, yet France and Germany are leading the way in commissioning artists to produce contemporary works in glass for churches. What draws artists to such commissions and why is this creative field so prolific on the Continent? To see stained glass requires a pilgrimage of sorts, for photographs will never do justice to a medium so utterly reliant upon architectural space and the changing conditions of light. On a visit to Cologne, nothing quite prepared me for my first impression of Gerhard Richter's monumental stained glass window for the cathedral. Even on a dull January morning it had a remarkably luminous presence, but when the sun briefly emerged from behind grey clouds the effect was startling, illuminating the cathedral's gloomy interior with resplendent colour. Despite the many secular examples one could cite, stained glass is a medium synonymous with sacred spaces, and indeed the church has been the recipient of some of the most interesting projects to date, created by artists of the highest calibre. However, few of these commissions are to be found in Britain. Rather, it is in France and Germany that a renaissance of experimental stained glass production has been taking place, especially since the 1980s, Richter's window for Cologne Cathedral only the most conspicuous example. In the post-war years a sentiment of renewal and reconstruction provided the impetus for many new building works. Rebuilding, repairing and conserving the nation's churches, abbeys and cathedrals became part of the national recovery, the restitution of a historical and architectural heritage or, in Germany's case, part of a post-war cultural rehabilitation. In France, of 8,000 buildings registered as historical monuments (many of which were ecclesiastical), 1,270 were partially damaged, 569 gravely damaged and 68 completely destroyed in the Second World War. Add to these figures the extant ruinous effects of the First World War and one gets an idea of the scale of the situation. Three broad alternatives presented themselves to the decision-makers: leave historic monuments in their damaged state, restore them to resemble their former state, or put out a call to artists and architects to create something new from what remained. All three of these options were used regarding the buildings themselves, but glass presented a particular problem. Although in France 50,000 sq. metres of glass had been set aside for safe keeping in the early days of the war almost as much again had been utterly destroyed. Replacing that glass has been a long and complex process, but one sustained by the particular conditions that exist in France. Crucially, whilst in Germany and Britain artistic patronage of this sort remains the province of the church, in France it falls under the patrimony of the state as a consequence, paradoxically, of the legal separation of church and state enacted in 1905. All such projects are public commissions using public budgets, the secular state effectively becoming the principal source and funding for sacred art. 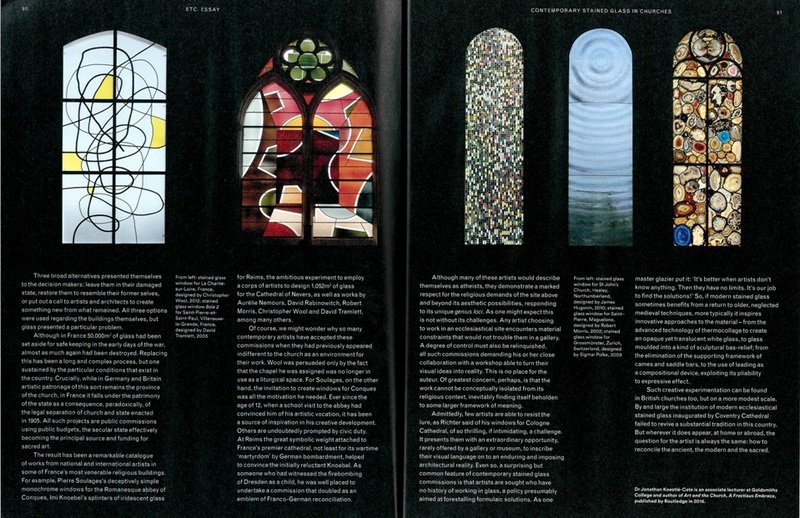 The result has been a remarkable catalogue of works from national and international artists in some of France's most venerable religious buildings: Pierre Soulages's deceptively simple monochrome windows for the Romanesque abbey of Conques, Imi Knoebel's splinters of iridescent glass for Reims, the ambitious experiment to employ a corps of artists to fill 1052 sq. metres of glass for the Cathedral of Nevers, as well as works by Aurelie Nemours, David Rabinowitch, Robert Morris, Christopher Wool and David Tremlett, among many others. Of course, we might wonder why so many contemporary artists have accepted these commissions when they had previously appeared indifferent to the church as an environment for their work. Wool was only persuaded by the fact that the chapel he was assigned was no longer in use as a liturgical space. For Soulages, on the other hand, the invitation to create windows for Conques was all the motivation he needed. Ever since the age of 12, when a school visit to the abbey had convinced him of his artistic vocation, it has been a source of inspiration in his creative development. Others are undoubtedly prompted by civic duty. At Reims the great symbolic weight attached to France's premier cathedral, not least for its wartime "martyrdom" by German bombardment, helped to convince the initially reluctant Knoebel. As someone who had witnessed the firebombing of Dresden as a child, he was well placed to undertake a commission that doubled as an emblem of Franco-German reconciliation. Although many of these artists would describe themselves as atheists, they demonstrate a marked respect for the religious demands of the site above and beyond its aesthetic possibilities, responding to its unique genius loci. As one might expect this is not without its challenges. Any artist choosing to work in an ecclesiastical site encounters material constraints that would not trouble them in a gallery. A degree of control must also be relinquished, all such commissions demanding the artist's close collaboration with a workshop able to turn their visual ideas into reality. This is no place for the auteur. Of greatest concern perhaps is that the work cannot be conceptually isolated from its religious context, inevitably finding itself beholden to some larger framework of meaning. Admittedly, few artists are able to resist the lure, as Richter said of his window for Cologne, of so thrilling, if intimidating, a commission. It presents artists with an extraordinary opportunity, rarely offered by a gallery or museum, to inscribe their visual language onto an enduring and imposing concrete reality. 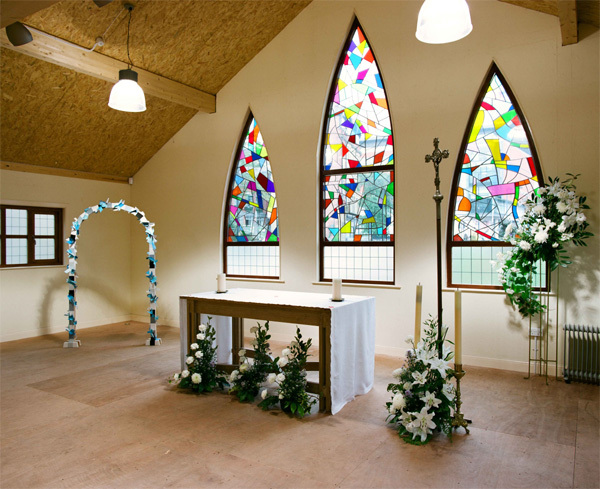 Even so, a surprising but common feature of contemporary stained glass commissions is that artists are sought who have no history of working in glass, a policy presumably aimed at forestalling formulaic solutions. As one master glazier put it, "it's better when artists don't know anything. Then they have no limits. It's our job to find the solutions!" So, if modern stained glass sometimes benefits from a return to older, neglected medieval techniques, more typically it inspires innovative approaches to the material. From the advanced technology of thermocollage to create an opaque yet translucent white glass, to glass moulded into a kind of sculptural bas-relief; from the elimination of the supporting framework of cames and saddle bars, to the use of leading as a compositional device, exploiting its pliability to expressive effect. Such creative experimentation can be found in British churches too, but on a more modest scale. By and large the institution of modern ecclesiastical stained glass inaugurated by Coventry Cathedral failed to revive a substantial tradition in this country. But wherever it does appear, at home or abroad, the question for the artist is always the same: how to reconcile the ancient, the modern and the sacred. 'The Work of Art and Sacred Places', NSEAD National Conference: Inclusion, Innovation and Diversity, University of the Arts, London, 2016. In 2016 trustees of Art and Sacred Places were invited to speak to delegates at the annual conference for The National Society for Education in Art and Design (NSEAD). The theme was: Inclusion, Innovation and Diversity: How outstanding art craft and design education can significantly lead on British values and the development of social, moral, cultural and spiritual developments. Dr Jonathan Koestlé-Cate and the Venerable Alastair Cutting introduced the mission of Art and Sacred Places through three projects broadly applicable to the theme of the conference. We began by suggesting that the relevance of spirituality to art and design education is inevitably a contested issue. To some people the notion of 'spiritual development' represents something rather vague while to others, especially within the church, it means something very specific. In many respects spirituality becomes the term of convenience whenever something is seen or said to exceed the material, conceptual or rational, even if such catholic possibilities bring with them their own difficulties. If the elasticity of the term contributes to its convenience of use it also underlines its somewhat vague and nebulous nature. Such difficulties aside, many would argue that, whether conceived in religious terms or not, the spiritual is rudimentary to human existence, and artists are among those who seek to give it sensuous form. In this short presentation there wasn't time to ruminate further on this question. Instead, a brief introduction to Art and Sacred Places and three of our projects served to give concrete form to this relationship between art and spiritual development. We stressed the fact that Art and Sacred Places is primarily art led although its Board is from a variety of faith, arts and business backgrounds. Our practice includes exhibitions and commissions, sometimes permanent, sometimes more challenging temporary commissions, and mutually beneficial interfaith projects. Our mission is to engage with new audiences by exploring the relationship between art and spirituality, encouraging debate, promoting understanding and educational interaction. 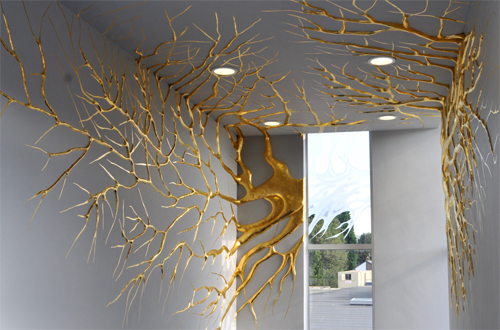 Three projects served to illustrate this mission: Nicola Dale's Between, a temporary artwork for Manchester Cathedral and Manchester Islamic Centre and Didsbury Mosque, Transpire, a permanent work for St Bede's Catholic College in Bristol, by Elpida Hadzi-Vasileva, one of the artists chosen to represent the Holy See in the 2015 Venice Biennale, and Rose Finn-Kelcey's Angel for St Paul's Bow Common. 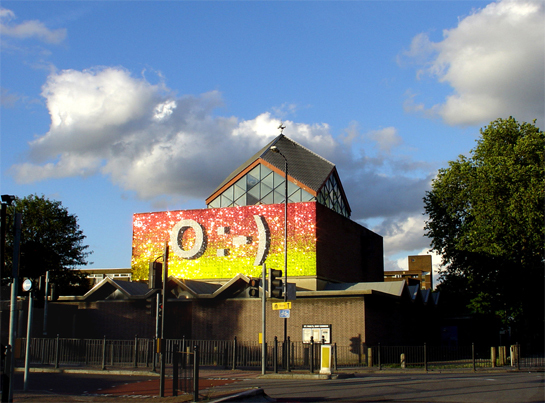 These three projects encouraged a sense of spiritual development through interfaith collaboration, through the creation of an experience of beauty and wonder in a humble school stairwell, and through an installation that had great appeal for the local community, acknowledging a communality of understanding between the church and its East London neighbours. 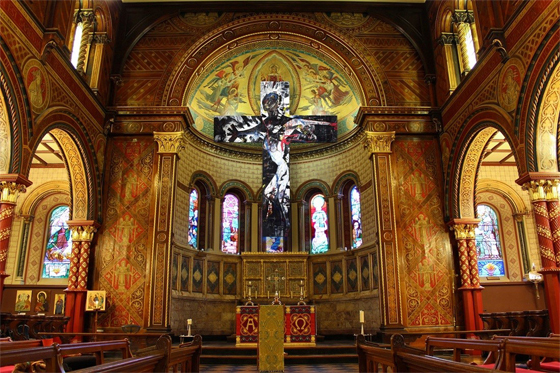 Art and the Church: A Fractious Embrace notes that a vibrant critical exchange between contemporary art and Christianity is being increasingly prompted by an expanding programme of art installations and commissions for ecclesiastical spaces. Rather than 'religious art' reflecting Christian ideology, current practices frequently initiate projects that question the values and traditions of the host space, or present objects and events that challenge its visual conventions. In the light of these developments, this book asks what conditions are favourable to enhancing and expanding the possibilities of church-based art, and how can these conditions be addressed? What viable language or strategies can be formulated to understand and analyse art's role within the church? Focusing on concepts drawn from anthropology, comparative religion, art theory, theology and philosophy, Art and the Church: A Fractious Embrace formulates a lexicon of terms built around the notion of encounter in order to review the effective uses and experience of contemporary art in churches. 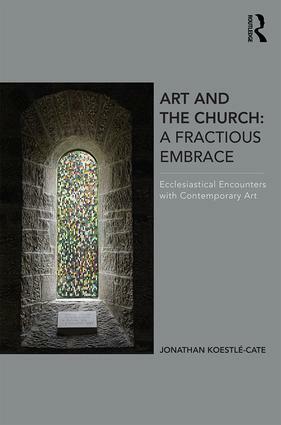 The author concludes with the prognosis that art for the church has reached a critical and decisive phase in its history, testing the assumption that contemporary art should be a taken-for-granted element of modern church life. Art and the Church: A Fractious Embrace uniquely combines conceptual analysis, critical case studies and practical application in a rigorous and inventive manner, dealing specifically with contemporary art of the past twenty-five years, and the most recent developments in the church's policies for the arts. The Stations will weave through religious as well as secular spaces, from cathedrals to museums. The art on display will run the gamut from Old Master paintings to contemporary video installations. Artists will include Christians, Jews, Muslims, and atheists. Instead of easy answers, the Stations aim to provoke the passions: artistically, spiritually, and politically.